Polyaire introduces the new AirTouch 3, an integrated all-in-one zone management control for air conditioning systems. Featuring a stylish touch screen display, the AirTouch 3 takes air conditioning zoning to the next level with a smart air control system that monitors temperatures in each zone and cleverly manages air flow. 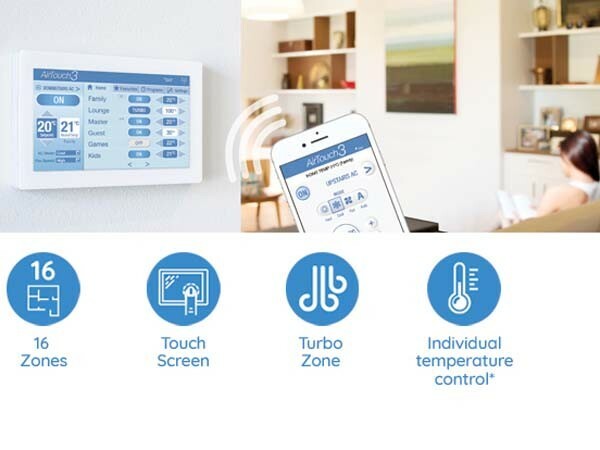 The all new AirTouch 3 allows you to control up to 16 zones in the home from one or two AC units, ensuring only those rooms being used are heated or cooled, thereby providing the assurance of maximum efficiency. In addition to cost savings from lower energy consumption, the control also assures enhanced comfort throughout the lifespan of the ducted reverse cycle air conditioner. Control the air flow in each zone in 5% increments and adjust your set point temperature for each zone from the touch screen or any smartphone or tablet device. The Individual Temperature Control feature in the AirTouch 3 allows each occupant in the home the flexibility to control the temperature in their specific zone. Additionally, it increases the efficiency of air conditioning systems by adjusting the air flow to maintain temperature in rooms that are already naturally warmed up by the sun, reducing wastage of air. This new level of comfort control is achieved with optional wireless Individual Temperature Control (ITC) sensors designed to actively monitor temperature changes around the home and adjust air flow accordingly. Residents not only save money on energy but also get peace of mind from not having to continuously monitor and control the conditioned air flow in any space to maintain desired comfort levels. With features such as smart energy and air flow management, intuitive zone control, temperature and run time monitoring, AirTouch 3 ensures the highest level of efficiency from air conditioning systems to save money on energy bills.